So it's been another crazy few weeks here at Sawdust City, first we were off to The Kiwi in Cambridge for their Casktravaganza where we were pouring along side our friends at Lake Of Bays and Nickelbrook breweries. We brought along a cask of our Lone Pine IPA that apparently had a little too much "jazz" in it, cause when we tapped it, yours truly got pretty much douched in sweet, delicious hop juice. It was a little messy, but worse things have happened. Then it was off to The Grand Theater in London for the 1st annual Arts & Draughts. For the first time out, this was a great event. Capped at 200 people the sold out event wasn't over crowded but had enough keen beer drinkers to keep all us breweries pouring and talking all night long. If this was any indication, this will be a fantastic event in the years to come. Thanks to all that set it up and we definitely look forward to next year. The very next day it was back to Toronto to not only keg the latest batch of Ol'Woody Alt (which is hitting bars, pubs and restaurants as we speak), but to also take part in what we can only assume is Ontario's first commercial attempt at a traditional Lambic style beer. 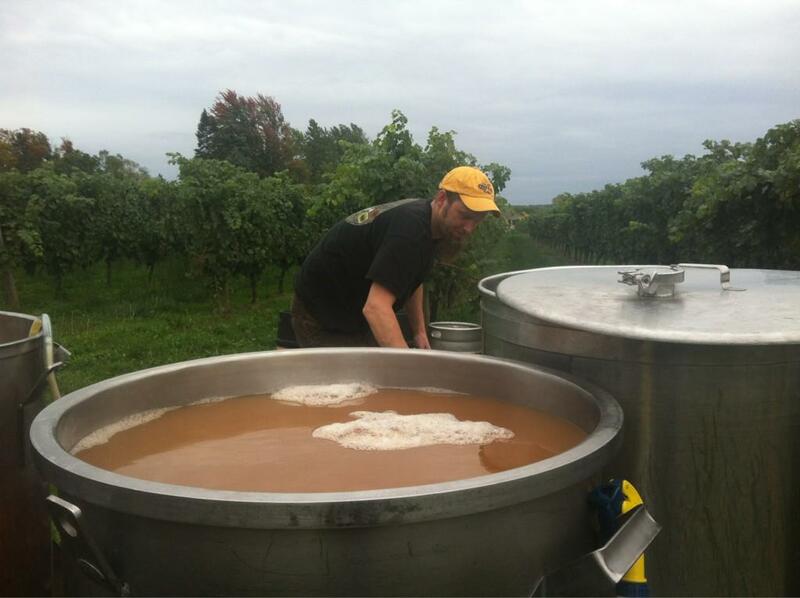 Employing a turbid mash, which can take well over 12 hours, spontaneously fermented with wild airborne yeast and aged in oak barrels for 3 years, it's easy to understand why it may not have been attempted yet in Ontario. But a few weeks ago while, I was at The Amsterdam brewery tasting some beers with Iain Mcoustra, (Amsterdam's head brewer) I mentioned in passing that I was thinking of attempting a lambic. Iain quickly piped up and said that he had been working on an idea for a lambic with Mike Lackey from Great Lakes Brewery for quite sometime, he then asked if I'd be interested in getting in on it with them. Obviously I said yes. Iain and Mike's plan was to brew the beer here in Toronto, put it into kegs and then ship it out to a winery in the Niagara Region. The beer would then be pushed into open fermenters, placed in a vineyard and then allowed to pick up which ever wild yeast may be floating about. It was an awesome plan, one in which I was glad to take part. Over the next few weeks, working with Iain, Mike and Jason from The Indie Alehouse, the plan was refined and cobbled together until we had it all worked out. So this past Thursday night we all convened at The Indie Alehouse for the first part of our three part plan, the turbid mash. Now, honestly we didn't do the full "traditional" turbid mash. That process requires many stages and temperature rests and mash boils, so we elected to go for a shortened 11 hour version of the turbid mash. Seeing as the whole plan was going to be carried out over 3 days, we figured it best to split the work load into shifts. Jeff Broeders, the brewer at Indie Alehouse and I drew the short straws and were given the task of completing the long, over night brew. But before we could do that, we had to drink some beer for inspiration, there may have been some Lambics consumed that evening. We began by milling this Ontario grown Red Fife Wheat, then it was straight into the mash. It's great brewing a new style of beer because you learn something new each time you do. This lambic was no exception, it was like unlearning everything you'd been taught in brewing school and working in a North American brewhouse. Take this mash for example, the grist to water ratio is completely out of wack compared to what we would normally do. It almost came spilling out of the mash tun. This was actually the second part of the mash in. There were two main steps, the first required only a portion of the water and grist to go in. We mashed in at 60C then raised to 100C and rested for a half hour. Then we added the remaining water and grain and reduced temperature to 70C and held for two and a half hours. Yes, two and a half hours. After the mash was completed, we transfered to the lauter tun and began the run off back to the kettle. With such a high portion of wheat, we thought the run off might be a bit of a strain, but in fact it went pretty smoothly. We then boiled the wort for four and a half hours. I don't have a picture of that cause no one needs to see a kettle boil for four and a half hours. Trust me. But what you do need to see are the 3 year old super cheesy hops Mike Lackey brought. If only you could smell these bad boys. If only. After the boil, that was it for Jeff and I, our shift was mercifully over...we may have been a little tired. Iain and Lackey took over from there, putting the boiled wort into kegs and transporting it out to The Good Earth Vineyards. They hand bombed all those kegs by themselves. The troopers. Now, I wasn't present for this next portion of the project, so I may get a few things wrong. My apologies boys. Once out at The Good Earth our lads were surrounded by grape vines, apple and peach trees. The beer was transferred into the open fermenters and allowed to sit, with open warm, inviting arms. Iain and Lackey now had the task of watching over the fermenters to ensure nothing unsavoury flew, dove or crawled into them. The weather was also a bit of an issue and tents had to be erected to protect the wort from the unruly Fall rain and wind. Jeff did manage to make it out to the vineyard at one point, but it was still a long night for the two of them. Eventually though, as it tends to do, day broke and revealed the lovely landscape that is the Niagara region. Finally after almost three full days, the hopefully inoculated turbid wort was transferred into its home for the next three years. We'll be doing this again next year and then the year after that at which point we'll be working on the blending. Like I said, this may be the first attempt at a true lambic in Ontario (we never did check and honestly it's not why we did it) and we aren't sure how exactly this is going to turn out, but it's like they say..."it's the journey not the destination". Just being a part of this experiment was a fantastic experience. Working with Iain, Mike, Jeff and Jason was not only fun, but also a great learning experience. The best part of collaborations are what you learn from them. Each of those guys are great brewers but at the same time they are all very different brewers. Getting to see how each of them works and how each of them looks at a problem is for me, an invaluable learning tool. Plus we got to drink a lot of really cool beers while we did it. Hopefully in three years we'll have about 25hl of a really great tasting lambic. And honestly with these guys behind the project I don't doubt it at all. But even if we don't, I think we've proved that Ontario is ready for this type of beer. It's about time that we as brewers start to push the envelope and begin trying new (and by new I mean a very, very old style of brewing) excited brews right here in Ontario. Ontario deserves it. This is so cool. I hope I can get to try some. I've always wanted to a wild lambic from this region. Any updates? Have you snuck any samples or gotten a look inside the barrels? Was this brew ever sold to the public?